Cancer Rising people are introverts, no doubt. They take quite a while to warm up to someone. But, after the connection has been made, they quickly become caring and affectionate, always aiming to please the one they opened up to, avoiding confrontation at all costs. People with Cancer rising sign in their horoscope are also easily influenced by by almost everything. This is one ascendant sign that could easily be described as the epitome of moodiness. This star sign’s moods can change in an instant. Cancer ascendants often come across as irritable and impatient, yet they are also very kind and gentle people. Simply put, they are very sensitive souls. Because this zodiac sign is easily influenced by others, it is important to be careful what you say to them. The tiniest remark might set them off. No matter your intentions, they could take your joke the wrong way. And beware, the Cancer ascendant also has a lot of trouble letting go of past memories. It’s as if they cannot forget how they felt and they do not want it. They “feel” more the average sun sign. It’s just who they are. It’s this same sensitivity that gives them an almost psychic quality. They are like sponges. They easily soak up what others around them are feeling. It’s as if they already know what you are feeling before you do. And with that, they adapt to you. Feeling your pain, your joy, your sadness, your jubilation. Being so emotionally intuitive opens people with their ascendant in Cancer up to a vivid imagination, one that is hyper-aware of the world around them. They often have an affinity for the creative arts due to this characteristic. They are able to passionately relate emotions the rest of the world hides or overlooks. Lookwise, the Cancer rising man and woman have a sensually attractive body. Their hips are usually broad and curvaceous in case of females. It is normal to gain weight and develop love handles due to this in their later years. The body shape be short and stocky, thus giving them a crab like look. Their face is round-shaped and usually very pleasing to look at. Casual relationships are not in the Cancer rising sign’s vocabulary. Every relationship must be intimate, otherwise it will not happen. They are loyal in relationships, even devoted to a fault, in some cases. And they will defend their loved ones whether they are right or wrong. 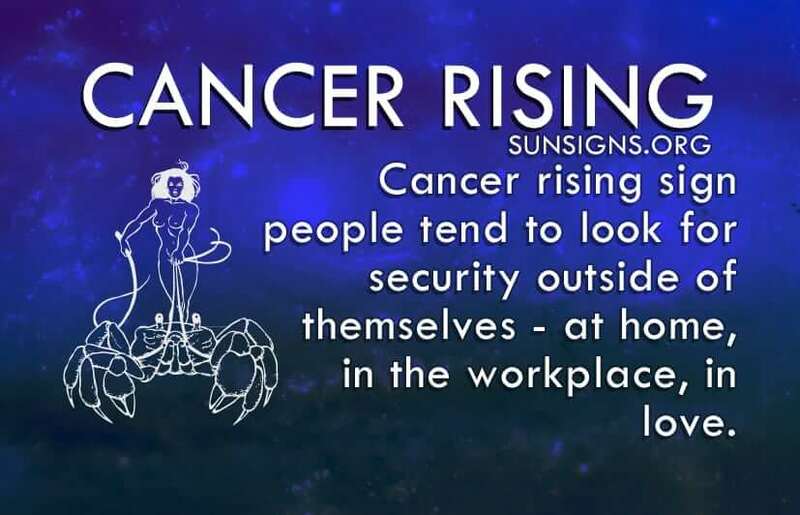 Cancer ascendants tend to look for their security outside of themselves – at home, in the workplace, in love. This could be in the form of a stable profession or a loving partner. They do not look first to become secure within themselves, but instead to find something that is secure. They will easily fall in love with someone who embodies this strength and security, and in many cases this person will manifest as an authority figure for them. Cancer ascendant sign also have a knack for business. They are some of the most fiscally prudent of the zodiac and very careful with money. Remember that for many of these star signs money is also an element of that security and safety they so desire. Although Cancer rising may possess these and many other talents, they often go unrecognized by the majority of those around them. Due to this, they are constantly seeking an unrequited recognition, leaving them feeling unappreciated and begging for praise. They need this to feel secure. Being so concerned with security, Cancer rising sign people in astrology are also heavily focused on the home. Their homes are their sanctuaries, often comfortable, warm and full. They have the tendency to hoard, drawing on the fact that they do not often let go of anything, be it tangible or emotional possessions. They cling. Imagine them clinging to the wind, letting it take them where ever it may go, so long as it is a wind that never dies.